Despite the surname Rick O’Shea is a proud Welshman and comes from good Welsh stock. His father John played for Cardiff was capped by Wales, and remains the first and only British Lion to be sent off! His parents moved to Cornwall when he was three and Rick grew up in the village of Mousehole just outside Penzance. Like Wales Cornwall boasts a proud tradition of Rugby and Rick learned the game with the “Pirates” of Penzance & Newlyn, known now as the Cornish Pirates. Having represented Cornwall at several levels Rick returned to Wales to continue his education at what was the South Glamorgan Institute or UWIC in new money. He arrived as a scrum half but left as prop, and that is long story, but he earned Welsh Student caps in both Union and League, also representing British and then European Students at the 13 man code. On graduation Rick returned to Cornwall as Pharmaceutical Rep and rejoined the Pirates. When Rugby turned professional in ’95 Rick played on a semi-pro basis until a persistent shoulder injury forced him to pack it up in 1997. At a complete loss as to what to do with himself on Saturday afternoons Rick offered his services to Radio Cornwall and enjoyed a couple of seasons as their rugby correspondent, the highlight being the journey he took with St. Just RFC as the “Tregeseal Tigers” competed in the Tetley Bitter Shield only for their odyssey to end one hurdle short of Twickenham, on the slopes of Billericay! The following year Rick returned to Cardiff and bought the Cameo Club with two Cyncoed old boys and former room mates Rhodri Williams and Huw Davies. Whilst tending the bar , Rick met Rhodri Jones the producer of Radio Wales’ “Sportstime”, and his show reel from the his radio Cornwall days earned him some postings to Eugene Cross and Virginia Park. Over the last few years Rick has established himself as integral part of BBC Wales’ Rugby Flagship Scrum V. Rick has a warm personality which has made him an ideal link between the programme and its audience, whether that be in a live studio setting or on one of his regular visits to report on the grassroots of the game. His versatility as a journalist is reflected in the fact that he is currently employed across most platforms either as a commentator, reporter, writer or presenter. As a freelance he has a wealth of experience that has seen him engaged by a number of institutions including RTE, TalkSport, as well as a many independent production companies. 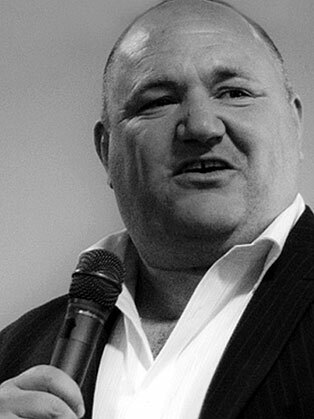 A number of magazines regularly commission Rick to write articles or conduct interviews with the likes of Gavin Henson and Jonah Lomu. Rick recently qualified as a medical doctor.